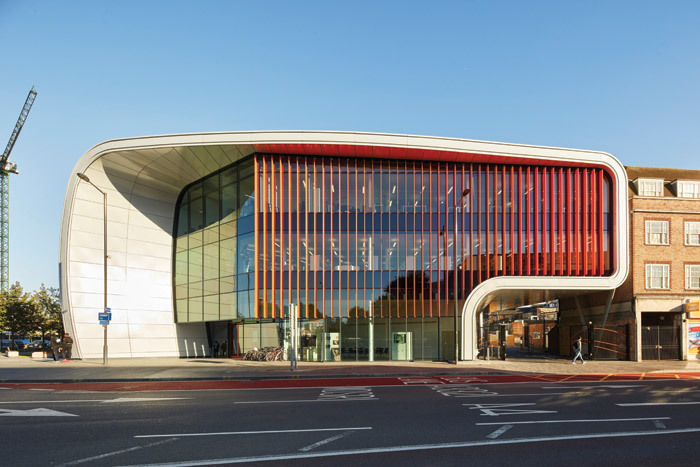 The Curve, a new £22m library and community centre, by bblur architecture, CZWG and Colorminium, has given Slough a big boost, finds Herbert Wright. The Curve, a £22m library and community centre in an eye-opening tubular volume, is Slough’s latest riposte to a stubborn reputation for being so rubbish that John Betjeman famously urged ‘friendly bombs’ to fall on it in his 1937 poem. Even earlier, Shakespeare referred to the area as a ‘slough of mire’. But since 2009, the local authority’s Heart of Slough plan has aimed to turn the town centre’s urban environment around. The first result was bblur architecture’s wavy, futuristic Bus Station (2011), unlike anything Slough had ever seen. bblur riff further on the possibilities of sinuous metallic form in The Curve, whose envelope was delivered by engineer Colorminium and interior designed by CZWG. The Curve is at a busy crossroads. To the west it faces Slough’s old brutalist library, by Fred Pooley, a 1964 building awaiting demolition, while bblur has made a mini-plaza at its eastern end, beside the Queensmere Shopping Centre car park, which sadly presents a blank grey temporary wall. It’s hard to talk about Slough without mentioning The Office where David Brent held court in a desultory Seventies block — The Curve is just to the south of where it stood until demolition. It curls into view behind the grade-II listed St Ethelbert’s (1910). Back in 2008, 3DReid Architects proposed a glass cultural centre under a curvy sculptural roof on the site, but director Matthew Bedward left to set up bblur, from which the shape of the current three-storey building emerged. ‘The idea of The Curve is to huddle and protect,’ he says. The main entrance is at the west end of The Curve’s tube, which shelters an inflected glass facade, with bright-red, vertical bris-soleil making a splash over the street. Inside, past a small Gallery, is the breezy sweep of the ground floor with reception and a cafe. The 90m-long building gently squeezes to a minimum 8.7m width in the middle and is 15m high. One long side is solid and straight. An inclined window, referred to as ‘the Eyebrow’, arcs across the curving side opposite, but sadly it faces the brick back wall of St Ethelbert’s. At the eastern end is a 280-capacity performance space that includes 180 tiered seats, mostly retractable to open up the space. 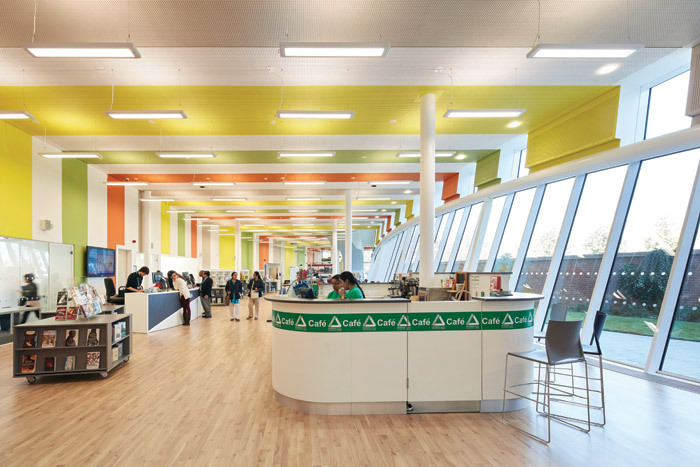 CZWG was appointed in 2012 for the interior scheme following its acclaimed Canada Water Library (2011). On ‘the street’ of the ground floor, white alternates with bands of gentle orange, yellow and green spanning the ceiling and sides. The interior surfaces are perforated — CZWG partner Stephen Rigg says a ‘main concern with acoustics was noise from the ground floor’s hard (wood) flooring’. Stairs at either end invite you to climb to the two library levels. The second floor is partially open to create a double-height space with the first, and recessed vertical windows on the curving side and parallel skylights bring light into the white interior. Looking up through one skylight, a bird statue can be spied on the roof — the architects deny responsibility. Colorminium, which has tackled tricky envelope realisations such as the Abell Nepp-designed European Bioinformatics Institute (2015), Hinxton, was appointed when budget cuts called for ‘value engineering’. Director Kieran Mallinson says they set out to ‘maintain the intent, but deliver the vision’. The roof was redesigned, and the sparkly metallic cladding originally envisioned became a paler aluminium. Signage needs improvement (toilets and gallery remain a mystery to many), and internal perspectives get interrupted by the cubical exhibition kiosks which Slough Museum has scattered around the building. Nevertheless, The Curve’s calm, lengthy interiors succeed. As for its excitingly sci-fi exterior, it has an echo of Zaha Hadid’s St Antony’s College Oxford and even the long east side ‘bone’ of her Heydar Aliyev Center masterpiece in Azerbaijan. Slough has had a big boost. And by the time the Elizabeth Line (formerly Crossrail) arrives in 2019, shopping centre works might even have opened up The Curve’s big eastern end to a reinvigorated Slough streetlife.